When Preethi suggested a few themes for the #190, I opted for mini cakes as I knew I had the recipe ready and also because I didn’t want to make any chocolates which was the other theme I liked. I have quite a few home made chocolate recipes on my blog. Maybe when I get better ingredients and time then I wouldn’t mind trying out another chocolate. Preethi blogs at Preethi’s Cuisine. What I like about her recipes is that she’ll always try to add healthy seeds, grains to her recipes. Her last post for example Carrot Vada left me in awe. First of the colour is so beautiful and secondly she added flax seed powder and used only rice flour. I’ve not tried Vadas using only rice flour. So coming back to the theme Mini Bakes, I thought Holi or not this recipe is going live. And anyway who says one can enjoy thandai only during the Holi festival? Thandai powder or syrup has a cooling effect design the hot summer so with summer approaching its a good way to enjoy some thandai powder….in muffins. I would like to take this opportunity to point out the differences between muffins and cupcakes. A glance at the table shared below is pretty self explanatory. I find that with eggless muffins the dome shape sometimes is not prominent, whereas with egg ones mostly the dome shape is there. For both I tend to use the tip of first 10 minutes at higher temperature and then the rest of the baking time at 180°C. Preheat the oven to 200°C. Line the muffin tray with muffin or cupcake liners. Sift flour, salt, baking powder and baking soda together into a bowl. Add thandai powder and mix well. In another bowl whisk sugar, milk, yogurt and butter together till its mixed well. Add the flour mixture to the liquid mixture. Mix it just enough so that the flour gets wet. Do not over mix the batter. Add about a tablespoon of the batter into the muffin liners. Put the muffin tray into the oven and bake the muffins at 200°C for 10 minutes. Then lower the temperature to 180°C and bake further for 10 -15 minutes or till the tops become light golden in colour. Insert a toothpick in the middle of one muffin. If it comes out clean then the muffins are done. Remove the muffins from the oven, let them cool down on a wire rack. Enjoy thandai muffins with a cup of hot tea, coffee or even with a dollop of ice cream. Do not over mix the batter, otherwise the muffins will not turn out soft. Add edible dried rose petals to the batter if you want to. Add more milk, tablespoon at a time if the batter appears hard. These thandai muffin looks so beautiful and tempting. Wanted to make thandai cake on Holi but didn’t get thandai powder in my local shop this time. Now you tempted me to try it soon. Thanks Sujata, making the powder at home is so easy. Beautiful flavours of thandai used to make muffins. That sounds so delicious. 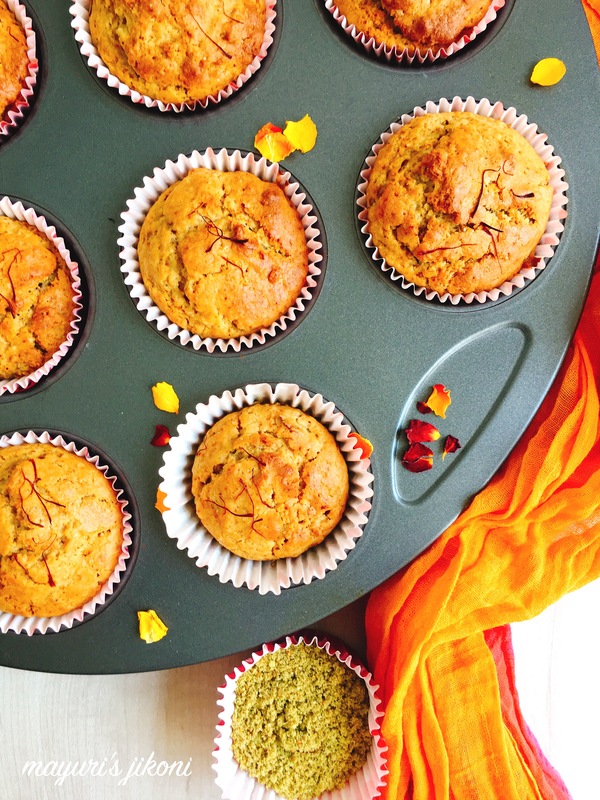 Holi is unimaginable without thandai and this is such a wonderful idea to make muffins from it. Thanks Lata. My neighbors loved the thandai flavor muffins. A different treat from the usual mithai. Thandai has cooling effect on the body and these thandai muffins are perfect for the Summer season. I liked your presentation di and your tip of baking the muffins at high temp for first 10 min and then lowering it. Will try this next time. Thanks Poonam. The tip certainly works to get dome shaped muffins. Oh, wow! These muffins look delectable! I love thandai, so I’m sure would love these too. 🙂 Brilliant fusion! Thanks Priya, easy to make, the vanilla cupcakes you made, just replace a bit of the flour with the thandai powder. These thandai flavoured muffins looks awesome.Baked to perfection.These muffins are perfect for snacks to satisfy my sweet tooth sometimes.Thank you for your kind words about me and my blog. Lovely share for the theme. Thanks Preethi and you’re welcome. Lovely muffins! 🙂 I first saw the post on insta and really loved the idea of adding thandai powder. This is perfect fusion recipe for Holi! And also I didn’t think there was any difference between a muffin and cupcake 😮 so thank you for that distinction! Thanks Ashima and you’re welcome. Wow, thandai muffins looks gorgeous mayuri ji, what a lovely flavor to try! Would love to try this sometime, a flavorsome treat to indulge! Thanks Priya, we too loved the different taste. Muffin looks tasty and the thandai flavour must be nice. You have baked them perfectly.